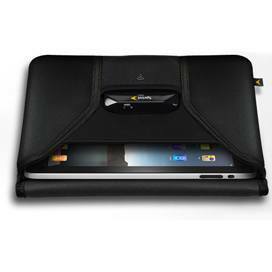 The White Box designed Sprint’s Overdrive gets cozy with the iPad in a specifically designed case that snuggly fits both the iPad and Overdrive. Using Sprint’s Overdrive 3G/4G Mobile Hotspot you can now connect your wifi capable iPad to the much faster 4G network. This faster and more efficient connection is why Sprint is giving customers a free case when purchasing the Overdrive.